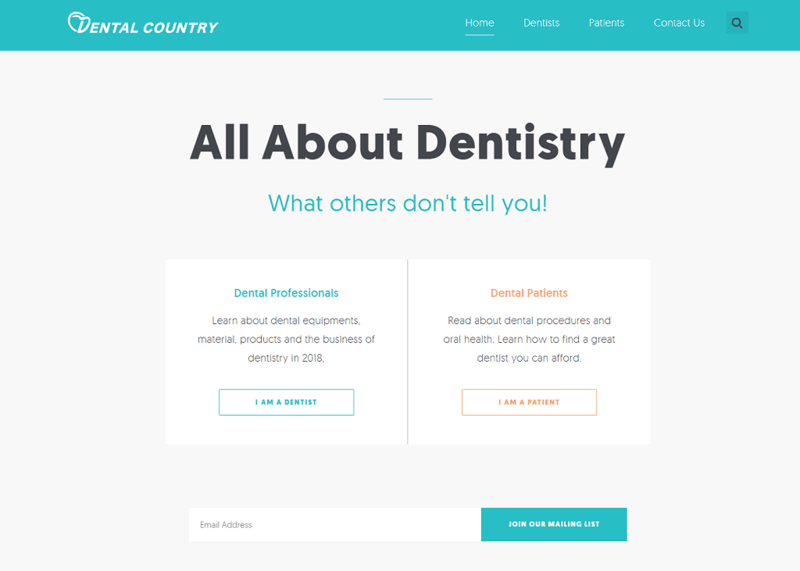 With all the noise, from all the vendors in the dental product marketplace, the principals at Dental Country came to us in an effort to create a clean and simple online information resource for both dental professionals and end-user patients. The result is a solid, easy to navigate, easy to update information portal with robust SEO (Search Engine Optimization) tools. Featured on the website are product reviews, observations, and recommendations from the Dental Country team for a wide range of existing and newly released dental products from manufacturers including WaveOne, Planmeca, and 3M. These reviews and recommendations are written and intended to alleviate much of the time-consuming research often performed by the dental professional or their team, slashing the time required to evaluate a new product. The reviews on the Dental Country portal are written from experience at the hands of active and retired dentists. An example of this is the review and summary of the Planmeca PlanMill® 40 S. The reviewer begins with speaking directly to the dental professionals, inviting them to learn how to make their practice more marketable. What a refreshing approach! With each feature that is listed for the PlanMill 40 S a direct, tangible benefit to the dentist is articulated. Data charts are borrowed from the original product’s documentation for easy reference, as are a few professionally produced embedded videos. The bloggers have even linked to a very handy ROI calculator, a great reference tool. And the Dental Country review isn’t just an advertising mouthpiece for the manufacturer’s product, it also goes into great length discussing disadvantages that should be considered when reviewing new product investments. The editors have also invited quotations and commentary from other users of this product – this is a truly powerful information forum. And the resources continue by including all documented references for further consideration and research – well done. You’d think that a company as big and powerful from 3M wouldn’t need a startup blog forum to help launch a product but think again. Dental Country’s review of 3M’s Scotchbond™ Universal Adhesive 2.0 hits the PROS and the CONS of this new dental bonding adhesive. Also written in the first-person by an active dentist, there’s much to learn and appreciate from this sort of honest review. The reviews and recommendations are presented in a very genuine, credible, fact-based manner. Other dentists should be thanking the reviewer for their honesty and 3M’s product development team should put this writer on their staff. A quick look directly at Dentsply Sirona’s webpage regarding their WaveOne Gold product family will show you exactly what you’ve come to expect from product manufacturers, great claims of a great product, no PROS, and CONS, no third party assessments – that’s reserved for our friends at Dental Country. And they’ve chosen to double-down on the recommendations of the WaveOne Gold family, this must be a solid product offering according to this review. The tone is this and all reviews on the Dental Country forum are truly intended to be of benefit to other dental professionals while confirming and professionally challenging the claims of the manufacturers. More dentists, dental professionals, and interested end-users should be checking out the latest reviews and blogs at Dental Country, it’ll save you many headaches and help you keep those pesty dental salespeople on their toes. Plus, dental product manufacturers should be leaping at the chance to have the pros at Dental Country review and post their thoughts about new products on the market.